A selection of STG Success Stories. 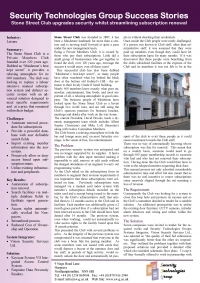 Stone Street Club of Maidstone, Kent, UK, is a prestige private members club who have recently upgraded their access control system and benefited for several additional opertational enhancements as a result. Click on image on the right to download this Case Study.